Bailey's Home Décor Shoppe - Bailey's Tree & Landscaping, Inc.
At Bailey's Home Décor Shoppe, 3811 Venice Road, Sandusky, Ohio 44870, you will find our extensive garden center and our gift shoppe. We feature gifts for the home, for the bird lover, seasonal and holiday gifts, jewelry, women's accessories and many unique items you won't find anywhere else. We feature a large selection of the popular GINGERSNAPS jewelry pieces, in both large and small sizes, in stock all the time. 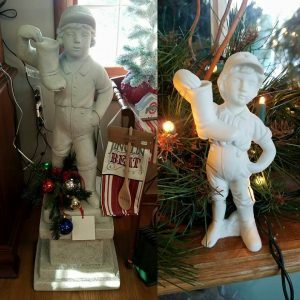 In addition, we are the official retailer of the iconic "Boy with the Boot" statue—just like the one in downtown Sandusky, available in two sizes. These can be placed indoors or outdoors for your own little piece of Sandusky's history. Stop in the shoppe to see and purchase both sizes. Check out the photos here of our current merchandise, and make sure you like us on Facebook for product updates and special sale notifications!